A tile steam cleaner can save you time, energy and effort when it comes to getting your tiles and grout clean. No need to “break your back” scrubbing grout. 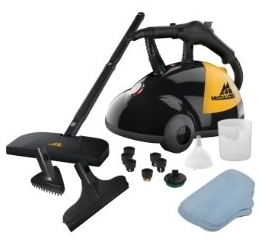 These steam cleaners will effortlessly lift the dirt right out! 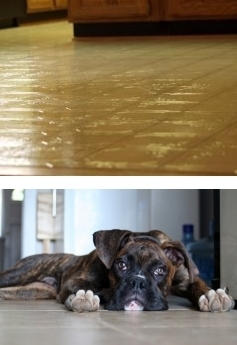 Steam cleaning your tile is a great way to clean and sanitize your home. We use tile in our kitchens, bathrooms, as flooring and even for outdoor flooring. There are many ways that you can clean your tiled floors. This includes using generic house cleaners. When cleaning your tile, you want to pay attention to the surface of the tile and grout which can absorb a lot of dirt. 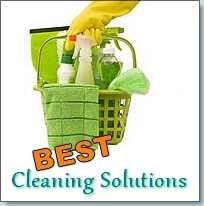 Many people use cleaners like Mr. Clean or Lysol to clean their tiles. A homemade solution that some people use is vinegar and baking soda. This is scrubbed into the grout with thick brushes and then washed. If you have heavy stains on your tile, you can use diluted hydrogen peroxide or bleach to clean. However, you should be very careful when using these chemicals as they are very dangerous and you should follow the instructions for their use to the letter. One thing to note though, do not use those chemicals on colored grout as it will become discolored. Besides using chemicals, if you want an environmentally friendly way of cleaning then you might want to use a tile steam cleaner. Tile steamers only use water and steam to clean, however I’m sure you’d be surprised by how powerful and effective they are at doing so. Besides being eco friendly, they are also people-friendly! Those other methods of cleaning your tile involve back breaking work. You have to manually scrub the grout. However, with a tile steamer, all you have to do is direct the steam across the grout and wipe away the dirt and water. The steam cleaner emits steam at high pressures which cause the dirt in your grout to surface. Some homeowners worry that the pressure of the steam would break their tiles, but I assure you that your tile is much stronger than you think. If you have any doubts of steam being able to clean your grout, have a look at the short video below. Now that you’re convinced, where can you find a good tile cleaner? There are many choices that you can find on Amazon. 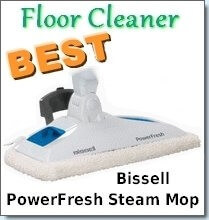 If you want quality, value for money and genuine steam power look no further than this powerhouse that looks like a regular home steamer but is actually a heavy duty steam cleaner. Up to 45 minutes of continuous steam at around 200 degrees Fahrenheit will not only deep clean but also sanitize and stains and ingrained dirt on grout will be a thing of the past. It is an all purpose steamer that can be used to steam clean everyday dirt away but also to clean carpets, upholstery, floors, tiles, deep ingrained dirt and even to detail your car and barbecue area. 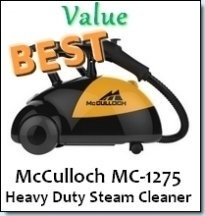 The McCulloch MC1275 will cost you around $140, giving you great quality cleaning for a fraction of the cost of other heavy duty steamers. 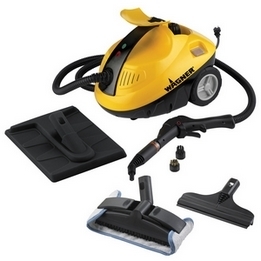 The Wagner 915 is a tile steam cleaning machine that we wholeheartedly endorse. It will cost you around $130 and packs 1,500 Watts of power. It will take only 12 minutes of preparation time and give you 45 minutes of cleaning which is more than enough to clean a room or hallway. Besides being great at cleaning grout, you can use it for other applications around the home. You can use it to remove wallpaper, clean windows, grills and many more. If you prefer to look at smaller steamers that are more affordable, have a look at our Handheld Portable Steam Cleaner reviews. 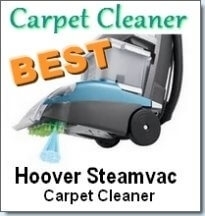 They won’t promise the powerful cleaner power of the above steamers but will still do a good enough cleaning job. If you also have hardwood floors in your home, you might want to consider purchasing a Hardwood floor steam cleaner.